W M Birchall (American; b.1884). watercolour heightened with white; signed WM Birchall 1917 (LL) and annotated by the artist HMS IRON DUKE. An unusual Birchall in that he has chosen to paint HMS IRON DUKE in a flat calm and not the "roughers" that he so often goes for! 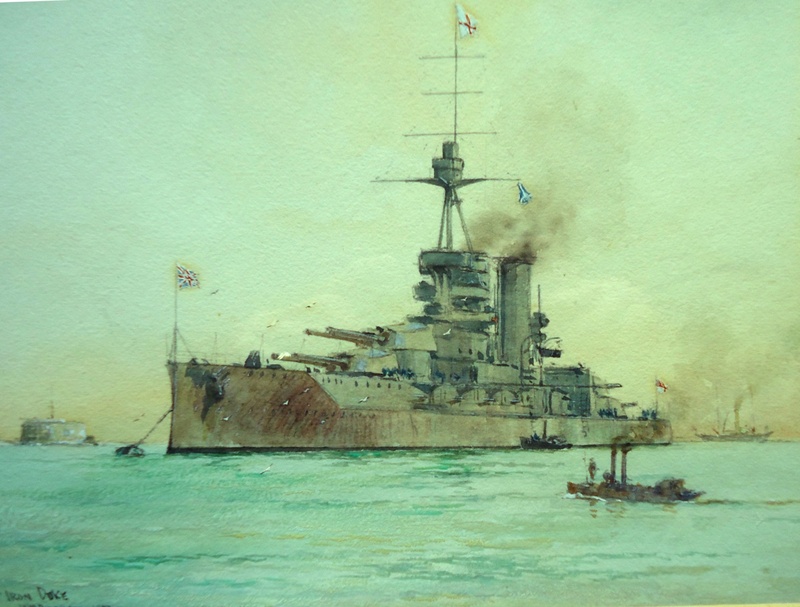 Although dated 1917 this watercolour shows the battleship wearing the flag of a full admiral at the fore and so although Admiral Sir John Jellicoe had handed over command of the Grand Fleet in November 1916 to Admiral Sir David Beatty, the latter shifted the flag from IRON DUKE to QUEEN ELIZABETH who thus became the Grand Fleet's new flagship. I think we must therefore asume that the scene painted here is dated sometime before November 1916 when the flagship, still HMS IRON DUKE (Captain F C Dreyer CB), had stolen away from Scapa for a short while for a brief visit to Portsmouth.